An investment banker is a person who provides financial transaction related help within the company. An investment banker helps in assisting the private and public corporation in raising their funds and he /she also provides strategic advises to the company when it comes to mergers, acquisitions and takeovers. Investment banker helps the company improve its financial position in the business market. There are several activities that an investment banker gets hold on when it comes to financial transactions. An investment banker deals with most of the money matter things such as financial issues. It is one of the core responsibilities of an investment banker that he/she should avail an arrangement of finance for their company. And the arrangement of finance can be debts or profits. Or else an investment banker also helps the company to merge itself with another company so that the company will be in a safe position. Not just financial transactions, an investment banker helps a company to manage its underwriting deals. And these underwriting deals can be delivered in a way where a company can buy certain shares of the company and they eventually sell those shares to the private or public institutions to earn more profit. These kinds of buying and selling of shares is a process where an investment banker handles the company’s underwriting deals. An investment banker helps a company with their financial situations and decisions. He/she may help the company to raise its capital through investment on private placements instead of wasting their investment on public offerings. Therefore, all these kind of financial statements will help a person who holds the company management and also builds a network for the sake of raising funds. These all kinds of private placements help the company raise a certain level of investment to save their loss. As mentioned earlier an investment banker helps a company to handle its mergers and acquisitions in a better manner. And being an investment banker of the company, he/she needs to handle all the money related issues of the company. Therefore, it is necessary to understand all the financial matters of the company to make sure that through these mergers and acquisition the company which is facing loss should have a level of security, to hold on their remaining profit. When a company faces serious loss due to some reasons, then it is an essential duty of an investment banker to check whether there is any type of solution for the current situation and provides some fundraising ideas to get the company back on their track. But it is not as easy as it sounds, when a company dooms all the partners of the company, try to cut them loose from their activities. But they never cut their profit share and during such a conflict situation, an investment banker provides them with an assurance of resolving the conflict of interest issues. For becoming an investment banker, a person needs to follow certain guidelines and should possess some kind of education to start their investment banking career and they are. It is the first step that a person needs to take while deciding about becoming an investment banker. A person who is interested in becoming an investment banker needs to choose a banking and finance related major because it will help him/her to handle finance related matter. Therefore, it is better if a person starts taking a banking major where he/she can learn more about financial subjects and materials. If a person who is interested in joining a financial stream while studying his/ her majors, make sure that he/she ends up being an investment banker. He/she needs to join some professional courses like computer course, microsoft operations and finance topics. All these kind of extra activities helps a person to learn more about their passion of being an investment banker. Therefore, following these steps can get a job of an investment banker in a financial institution. It is possible that if a person wants to become an investment banker then it is necessary to make sure that he/she does know all the matters and materials about financial management. Therefore, after check listing all the materials it is time for him/her to take a summer internship in a financial institution where he/she can learn more about becoming an investment banker. Therefore, a summer internship can expose him/her to the world of financial statements of different departments. During a summer internship, a person needs to start his / her plan where he/she should start building networks with people who really can help him/her to grow in his / her professional career. Therefore, it is necessary to handle all the network building to create a concrete basement of becoming an investment banker. These all things can help a person be a successful investment banker professional. This is the final thing that a person needs to prepare himself/herself for an interview of his / her dream job. While attending and preparing for an interview in financial institutions the first thing he/she needs to think is about their personality, presentation and academics. These three elements of a successful career can get his / her position of becoming an investment banker. Therefore, it is necessary to take good care of his / her personal presentation while appearing for an interview. It is one of the important stepping stones where a person will assure himself or herself for becoming an investment banker. Opting for masters degrees in business management can help a person grow better in his/her desired successful career. Therefore, choosing a master’s degree in business management is a better decision that a person could take who wants to become an investment banking analyst. When a person is offered a job of an investment banking job, he/she should think about joining investment banking courses where they train all the upcoming investment bankers to face this intense financial world. Therefore, it is necessary to understand the value of these training classes to be successful in his/her professional investment banking career. There is certain kind of eligibility criteria that a person needs to know to make a career in investment banking and they are. As explained earlier, a person who needs to become an investment banker should possess a bachelor’s degree and some experience in a financial institution. And a person who holds all these qualifications will be given the role of an investment banker. 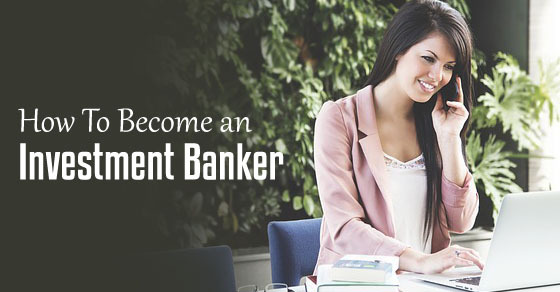 There are some criteria that a person needs to possess on how to be an investment banker. Therefore, it is necessary to understand all the importance of these qualifications and requirements in the financial field of working. After the completion of given a bachelor’s degree, that person should think of taking a master’s degree in business management. Joining a master’s degree in business management will help him/her to avail more information about the duties of an investment banker. During these master’s degrees, a person can also start taking an investment banking internship which can add an additional value while joining the jobs in investment banking. A person willing to become an investment banker needs to provide good potential value to his / her educational details and that can happen if a person starts taking a professional course for experience. And eventually, those professional courses will help him/her to be more confident of the skills that he/she possesses to become an investment banker. Therefore, a potential value towards education can provide a person a bonus of a successful career in investment banking. For an investment banker who studies all the above-mentioned matters and who possess all the above-mentioned education qualifications may have some job requirements in a similar field and they are. An investment banker is a person who provides financial transaction related help within the company. An investment banker helps in assisting private and public corporation in raising their funds and he /she also provides strategic advises to the company when it comes to mergers, acquisitions and takeovers. Investment banker helps the company improve their financial position in the business market. There are several activities that an investment banker gets hold on when it comes to financial transactions. Floor broker is a person who trades all the trading goods or in other words, he/she sells all the goods to another on the behalf of their investors. A floor broker works on a floor where it seems he/she can handle the financial requirements of the company. A floor broker keeps an eye on these trade goods and when it’s time to sell goods for the sake of the benefits of the company then he/she sells it to the concerned department on behalf of his/ her investors. A financial manager holds a similar duty of an investment banker, but the only difference would be that he/she can plan all the budget statements of the company whereas an investment banker helps them invest in different securities. Therefore, a financial manager holds all the internal activities of the company and maintains all the financial record statements of the company. Therefore, it is clear that an investment banker handles slightly different work than of a financial manager. As mentioned above, an investment banker holds such a qualification that looking at those qualifications, the investment banker average salary should be a lot better than any stream and as per some researched numbers of figures, an investment banker receives a total salary of 8 lakhs annually including all the bonus and profit sharing from the company. Therefore, being an investment banker is not an easy job when it comes to an approximate salary. And the bottom line is that becoming an investment banker is a process where he/she needs to follow all the qualification details provided by the necessary financial institutions. And when a person becomes an investment banker then it is his / her duty to handle all the financial transactions of the company. It is possible that a person who became an investment banker may be a sole owner of financial activities of the company and if the company suffers a loss then an investment banker needs to provide them a solution by raising their funds through some kind of investment plans. Therefore, we would end this discussion saying that if any person thinks about becoming an investment banking then they need to follow all the above-mentioned rules and regulations of becoming an investment banker. There are also certain Do’s and Dont’s of becoming an investment banker. Next articleHow to Face an Interview for Lecturer Post?